Collins Booksellers - Kids Combo Pack For Knowledge by Sham, 9781301262090. Buy this book online. This is a power pack of famous books by kids books well known author - Sham. The pack comes with the best kids books for teaching kids on one word substitutions, anagrams, Nobel laureates, countries, languages, scientists, inventions, athletes, animal facts, planet facts, olympic facts and other things in a funny and interesting way. This will help the kids in understanding the things very easily and also the book is made exclusively for training kids. This power pack comes with below famous books for Kids. This combo pack will come at a much lesser price than buying the books individually. This book is exclusively designed for Kids. The book consists of several questions,puzzles,tricky questions exclusively made for Kids. The book both entertains children and also provides knowledge on various topics.The book is real fun for Kids. Knowledge and fun provided in one single book for kids. The book is designed highly keeping in mind about kids and their way of learning. 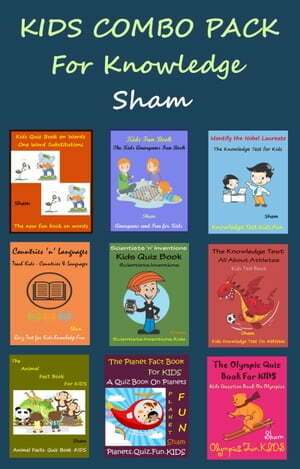 Sham is a famous author for several Kids Books,Kids Puzzles,Children Puzzles, Children Questions,Children Games,Kids Games,Kids Fun Books.